The Monk Adrian of Poshekhonsk was born at Rostov the Great at the end of the XVI Century, of pious parents named Grigorii and Irina. The Monk Adrian accepted monastic tonsure at the monastery of Saint Kornilii of Komel'sk (Comm. 19 May). Among the brethren gathered around the Monk Kornilii were no few capable builders and iconographers, such that the monastery churches were constructed and adorned by the monks themselves. In the final years of the Monk Kornilii's life, Kazan Tatars made a plundering invasion of the locale of the monastery, and he led off all the brethren to the River Ukhtoma. But the Tatars did not touch the monastery, being frightened off by the sight of the many soldiers defending it, and they soon withdrew from the Vologda district. The Monk Kornilii returned to the monastery with the brethren and reposed there on 19 May 1537. Three years later after the death of the Monk Kornilii, the Monk Adrian, – then in the dignity of monk-deacon, began strongly to desire to go off into a wilderness place and found a monastery in honour of the MostHoly Mother of God. The Lord helped the monk fulfill his intent. At the Korniliev monastery there arrived a certain unknown black-robed starets-elder of striking appearance. Meeting the starets in church, the Monk Adrian asked him his name, but the elder did not answer. When the Monk Adrian invited him to his own cell and besought him to share something of benefit to soul, the starets answered, that he would show the monk the wilderness, wherein he should build the church and monastery in the name of the MostHoly Mother of God. The Monk Adrian immediately went off to the monastery head – the hegumen Lavrentii, and began to seek blessing for the wilderness quietude. 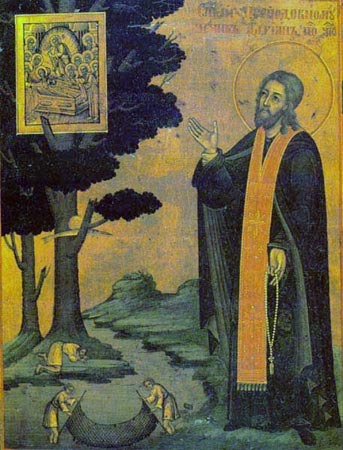 Having in mind the command of the Monk Kornilii, – bidding that there be released from the monastery any monks wanting to withdraw into the wilderness, hegumen Lavrentii did not hinder the Monk Adrian but instead gave him his blessing, and likewise sent off with him his assistant – the starets Leonid. Having prayed at the grave of the Monk Kornilii, the Monk Adrian and starets Leonid set off on their way, led by the mysterious black-robed monk. The Monk Adrian carried with him an icon of the Uspenie (Dormition) of the Mother of God, also written by him. On 13 September 1540, the eve of the feast of the Exaltation of the Cross of the Lord, the Monk Adrian and starets Leonid arrived in the wild Poshekhonsk forest, situated amidst the settlements of Belta, Patrabol'sha, Shel'shedol'sk and Ukhorsk. They halted at the banks of the River Votkha. And there the starets leading them suddenly became invisible. The astonished travellers began to chant the canon and service of the feast, with tears of thanks to God. And indeed this was a portent of the future famous monastery – a place of the glorification of God – like a bell pealing throughout all the surrounding settlements. For three years the Monk Adrian and starets Leonid survived in the wilderness solitude, suffering want, overcoming temptations from the devil and the whisperings of wicked folk, and then they set about their sacred intent. Choosing a suitable moment, the ascetics set off to Moscow to Metropolitan Makarii, to seek blessing for the establishing, on the Peshekhonsk side of the River Votkha, of a monastery and temple in honour of the Uspenie (Dormition) of the Mother of God. Saint Makarii gave his blessing to the ascetics to build the monastery, and he entrusted them a church-grant grammota-document; the Monk-deacon Adrian he ordained to the priesthood and elevated to the dignity of hegumen. In this grammota-deed given to the Monk Adrian, the sainted hierarch bid "priests, deacons, monks and laypeople to hearken to and obey him in everything, as becometh for a pastor and teacher". At Moscow the Poshekhonsk ascetics found generous benefactors who, beholding the audacious elders, gave them abundant offerings for the building of the church. Having returned to their wilderness spot on 31 May 1543, Saint Adrian laid the foundation for the church with refectory, in honour of the Uspenie of the MostHoly Mother of God. Having embellished and consecrated the new church, the Monk Adrian set about the construction of the monastery. At the monastery was introduced the strict ustav (monastic rule) of the Monk Kornilii. Having nothing of their own, a little sufficing everyone, the monks devoted a large portion of their time to prayer, both in church and in cell, and no small time was allotted to the reading of Holy Scripture. And during the reading this was done: "not in elegant voice, nor for effect, but in an humble and mild voice: one reads, and another speaks of what is read", and they likewise read in private. The Monk Adrian, besides his tasks as hegumen, also occupied himself with the writing of icons, and when his holy soul wished for complete silence, he withdrew for prayer into the depths of the forest into a cell with chapel built by him, a verst distance away from the monastery. Six years after the founding of the monastery, starets Leonid peacefully reposed to the Lord. And the Monk Adrian with the brethren reverently buried him. The brethren during this time had increased. The monks built three cells as dwellings and a fourth for the preparation of food and the baking of bread. Saint Adrian began to make plans for the erection of a large stone church and he gathered for this purpose a sum of money. But a year after the repose of starets Leonid, in 1550 during Great Lent on the night of 5 into 6 March, with the commemoration of the 42 Ammoreian Martyrs (Comm. 6 March), – armed robbers burst into the monastery and after a beating they murdered the Monk Adrian. The holy relics of the MonkMartyr Adrian were uncovered on 17 December 1626, solemnly transferred into the monastery church and placed into an open crypt, – over against the right cleros-choir. At the grave of the Monk Adrian occurred many miracles.